In part 3 of this series, I want to shed a light on the difference between the types of Migration in ESX and Hyper-V and the differences in storage between the both of them. Although I think most of the readers know the differences, I will start with a brief summary. Hyper-V QuickMigration: When you want to move a running Virtual Machine from one host to another with as little downtime as possible, you can use QuickMigration. On host-A the VM will be suspended to disk, and then host-B will unsuspend the VM and run it. Hyper-V & ESX Cold Migration: Moving a VM that is not running, to different host and/or different storage. ESX VMotion: Moving of a running VM to a different host, without downtime. ESX Storage VMotion: Moving the disks of a VM to different storage without downtime (VM doesn’t move). This entry was posted in Hyper-V, VMware and tagged ESX 3.5, Hyper-V, Microsoft, part3, Series, VMware on December 2, 2008 by afokkema. Gabrie heeft Part 2 gepost van zijn serie Hyper-v, not in my Datacenter. After you installed your hypervisor you want to virtualize your physical servers on it. When doing the research for my presentation I was very surprised to find some strange limitations in which guest are supported with Hyper-V. Can you believe that not all Windows Server versions are supported? Well neither could I. Windows 2000 Server is only supported with SP4 and 1 CPU. Windows 2003 Server is only supported with SP2 and 1 or 2 CPUs. Windows 2008 Server is supported with 1, 2 and 4 CPUs. and there is Linux support for SUSE Linux Server 10 sp1 / sp2 with only 1 CPU. This entry was posted in Hyper-V, Virtualization, VMware and tagged ESX 3.5, Hyper-V, Microsoft, Part2, Series, VMware on November 28, 2008 by afokkema. Gabrie van Zanten (www.gabesvirtualworld.com) is bezig met een serie over Hyper-V, not in my Datacenter. I’ve written about Hyper-V and ESX is an objective view on how things are at the moment, but still it looks like the only thing I’m doing is Windows-bashing. I decided to dedicate a blog post to it, so everyone can find out for them self if my points are valid. The big question of my presentation is: “Which is better for my datacenter, Hyper-V or ESX?”. I’m looking at both hypervisors to see which features they have that would make them suited for running in the datacenter discounting nice features that I would rarely use. Here we go……. Part 1 kun je hier vinden: http://www.gabesvirtualworld.com/?p=103#more-103. Uit betrouwbare bron heb ik vernomen, dat morgen Part 2 gepost gaat worden. Dus hou www.gabesvirtualworld.com in de gaten. This entry was posted in Hyper-V, Virtualization, VMware and tagged ESX 3.5, Hyper-V, Part 1, Series, VMware, Website on November 27, 2008 by afokkema. 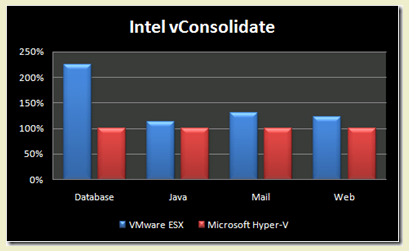 Kenon Owens heeft een blogpost gemaakt over de benchmark tool van Intel, vConsolidate. Met deze tool zijn een aantal tests losgelaten op VMware ESX en Hyper-V. This entry was posted in Hyper-V, Virtualization, VMware and tagged Benchmark, ESX 3.5, Hyper-V, Microsoft, vConsolidate, VMware on November 26, 2008 by afokkema. So what exactly is Microsoft Hyper-V Server 2008? Following are some bits I’ve collected that you might not see/read on the Web site or TechNet (or maybe you will). Because Hyper-V Server 2008 shares kernel components with Windows Server 2008, we don’t expect special hardware drivers to be required to run Microsoft Hyper-V Server. The maximum number of guest instances that can run on Microsoft Hyper-V Server 2008 is 128 (of course this is dependent on the hardware, memory and workloads). Additionally, each guest OS must have a valid license. Hyper-V Server 2008 runs/supports all the guest OSes supported by its big brother, WS08 Hyper-V. See here for a complete list. Windows Server licenses are not included with Microsoft Hyper-V Server 2008. Client access licenses (CALs) are only required for Windows Server and all Windows Server images that are virtualized, regardless of virtualization platform (e.g., ESXi). No CALs are required for Hyper-V Server 2008. This entry was posted in Hyper-V, Virtualization and tagged Hyper-V, Microsoft, Microsoft on October 1, 2008 by afokkema. VMware heeft een vergelijking gemaakt tussen Hyper-V op Server Core vs ESXi. Hieronder zie je de uitkomst van deze test. Verder vind je twee videos met meer informatie over de installatie van beide Hypervisors en een video over het configureren van iSCSI op beide Hypervisors. Our second video starts where the first left off and takes Hyper-V and ESXi through the steps needed to configure two iSCSI datastores for VM use. iSCSI setup is a standard task for any virtualization user that wants to take advantage of shared storage for VM migration and high availability. ESXi’s Windows-based Virtual Infrastructure client makes the iSCSI setup quick and easy. For Hyper-V, the "Windows you know" is nowhere to be seen. Instead, working with Server Core requires you to key in a long sequence of obscure commands to configure iSCSI initiators and targets, partitions and file systems. We generously showed the Hyper-V setup executed with no delays, although it took us hours of digging through Microsoft documents and knowledgebase articles to find the right commands to use when configuring iSCSI in Server Core. This entry was posted in Hyper-V, Virtualization, VMware and tagged ESX 3i, ESXi, Hyper-V, Microsoft, Microsoft, VMware on September 27, 2008 by afokkema. Microsoft heeft eindelijk de licentie voorwaarden aangepast voor het haar software m.b.t. virtualisatie. Microsoft is updating its software licensing terms for 41 server applications, including Microsoft SQL Server 2008 Enterprise edition, Microsoft Exchange Server 2007 Service Pack 1 Standard and Enterprise editions, Microsoft Dynamics CRM 4.0 Enterprise and Professional editions, Microsoft Office SharePoint Server 2007, and Microsoft System Center products. With the new terms, the company is waiving its previous 90-day reassignment rule, allowing customers to reassign licenses from one server to another within a server farm as frequently as needed. For many customers, the change will reduce the number of licenses they need to support their IT systems, increase agility, and simplify the tracking of application instances or processors because customers now can count licenses by server farm instead of by server. Microsoft has updated its technical support policy for 31 server applications so that customers can receive technical support when deploying those applications on Windows Server 2008 Hyper-V, Microsoft Hyper-V Server or any other third-party validated virtualization platform. Now customers can get the same level of product support in a virtualized environment that they are accustomed to with nonvirtual environments. More information is available at http://support.microsoft.com. To enable this support policy, Microsoft launched the Server Virtualization Validation Program in June 2008. The program is open to any software vendor to test and validate its virtualization software to run Windows Server 2008 and previous versions of Windows Server. To date, Cisco Systems Inc., Citrix Systems Inc., Novell Inc., Sun Microsystems Inc. and Virtual Iron Software Inc. are participating in the program. This entry was posted in Hyper-V, Microsoft, Virtualization, VMware, Windows and tagged Hyper-V, VMware, Windows on August 20, 2008 by afokkema.